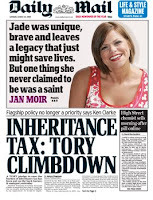 The Daily Mail is taking great pleasure in reporting BBC facing viewer backlash over coverage of Jade Goody's death. Yes the BBC coverage was totally excessive - as it has been almost everywhere else - but can the Mail really complain? It was lead story on their website Sunday, half their front page Monday and if you search 'jade goody' on the Mail site, you'll find 10 articles from the last two days alone. On a related issue, hearty congratulations to the Independent. On Monday, they put a picture on their front page of a successful young woman in her late 20s who had talent, class and had achieved something worth celebrating. So why did none of the other papers take much interest in the Cricket World Cup winning England team?